I searched, but didn't find any posts about Boba Burger in Morton Grove. I'm not a writer, so this will be brief. Hopefully there will be more skilled reviews. Located in the Classic Bowl bowling alley, Boba Burger is a Vietnamese burger fusion place. I had the regular Boba Burger, 5 oz party of 80/20 ground beef, adding avocado. The ingredients seemed fresh and well prepared. Burger was nicely cooked and overall was very solid. The fries were hand cut, but had a slight off taste, I seem to be sensitive to that for some reason. There used to be a Boba Burger in Arlington Heights on Devon and Tonne Rd. I wonder if they have any relationship. I only ate there once. If I remember the burger was good, though I think a little overpriced. Honestly the only thing I really remember was the counter girl was really endowed. midas wrote: There used to be a Boba Burger in Arlington Heights on Devon and Tonne Rd. I wonder if they have any relationship. So the burger was stacked, but how about the buns? Don't know. I couldn't take my eyes off the burger. Tons of positive reviews on Yelp. Been there twice. Very nice service - counter ordering. Food was good, will return for sure. Seems like a great place for an LTH meet. Notably for the north suburbs - they are open LATE. I did not know that a Boba Burger thread was made. I actually help out the Boba brothers whenever I have some time. They care about the food they serve so if you guys/gals have any suggestions or complaints just message me or their Facebook page. If you guys ever want to do an LTH meet up around the Morton Grove area, let us know! We would definitely get everything ready prior to the group arriving. As for the fries, the vendor get different potatoes all the time so the taste may be off, but we try our best beforehand to find the right amount of time to cook and etc. We are truly surprised by the amount of reviews on Yelp, but it's a blessing and sign that our hard work is paying off. Thank you LTH for giving us a look. Gave this place a try for lunch today. Fans of fatty lechon will enjoy the lechon banh mi. Good flavor on the meat, especially the non-lean part. Hot dogs are a generous size. "Shakes" are much more like smoothies, but tasty. Only minus was a 20-minute wait for a basic lunch order; will be hard for these guys to grow their business if that is the norm. Count me in amongst the hordes of fans over on Yelp. Thanks for the heads up as you wont happen to notice Boba Burger if just driving by as it's inside a bowling alley as mentioned. Aside from the fries which I thought were just ok, needed more browning, the rest of the stuff I've tried has been nice. The beef in the burger was abundant with juice and in the first tier for that price point. 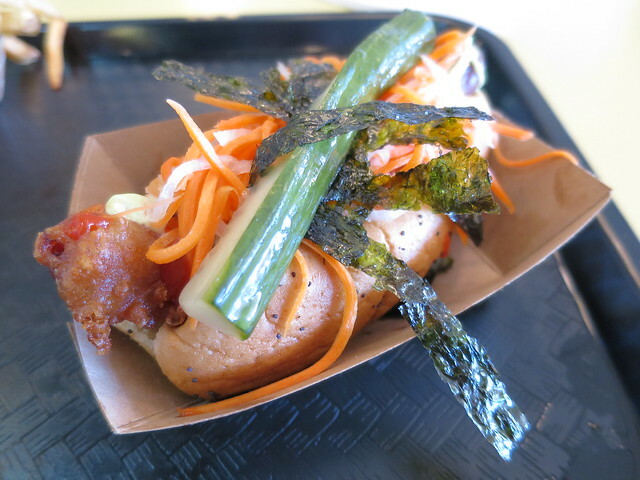 Also first class in the novelty hot dog category is the Tokyo dog. They dip a Vienna Beef wiener in tempura batter and give it a fry. When nice and golden it gets topped with wasabi aioli, nori, picked veggies, and sriracha ketchup. 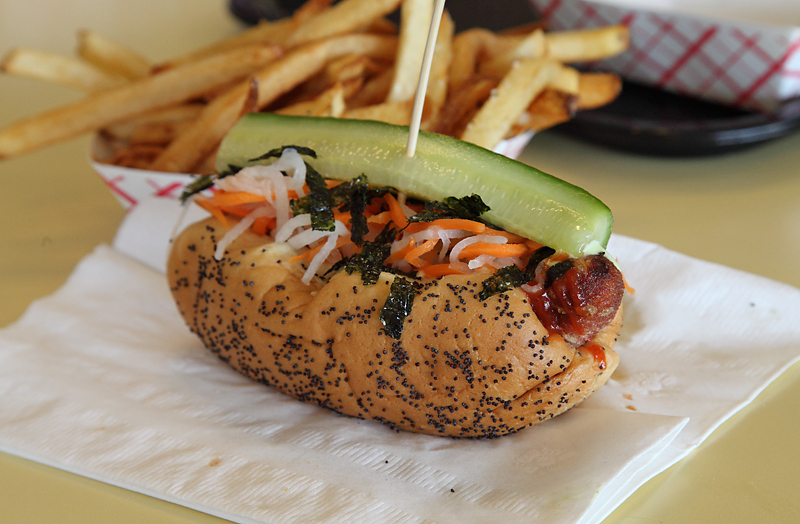 If you've enjoyed the Japanese Dog at Ivy's in Edgebrook you should get a kick out of this. This has become a regular lunch place. Really enjoy the Banh Mi. RallyMike wrote: This has become a regular lunch place. Really enjoy the Banh Mi. How does it compare to Nhu Lan on Lawrence? Made my inaugural visit to Boba Burger recently. I don't have a ton of comparators but I feel confident in saying this is among the best food to be found in a bowling alley anywere. The Seoul Burger is a five ounce patty topped with American cheese, kimchi, kalbi glazed bacon, fried egg, lettuce, tomato. It's a mess, but an absolutely delicious mess. Lots of toppings that worked well together in a sweet and funky way but without completely dominating the beef. Not getting the Tokyo Dog on a trip to Boba would be a silly mistake. Tempura fried (the rest of the dog had more batter than the pic shows), and covered with wasabi aioli, sriracha ketchup, nori, and pickled vegetables, this thing was great and quite a bit of fun. The fries were the lowlight of the meal. They weren't bad by any stretch; they just didn't have the crispy/creamy thing going that so many Chicago burger and dog joints pull off (an underappreciated blessing of living in Chicago). If I had to guess, I'd say they're only frying their potatoes once. An easily fixable problem. Although, quite frankly, given the wide availability of fries all over town, if you're hungry enough to add an order of fries to an order of a burger and a Tokyo Dog, you should get a second dog. And then you should go bowling to burn off a few calories. Had a nice lunch over at the bowling alley today and it included the very tasty Tokyo Dog . . . This is so close to the office and yet I always seem to forget that it's a viable lunch option. So, how are the boba beverages? Boba Burger, I sense culinary obsession coming on. House-ground burgers & natural casing dogs with an Asian twist. Boba Burger, Count me a Fan! Boba Burger, Saturday brunch with the bride! She's a fan though has never been to the physical location, her office is in Morton Grove and they order from Boba once or so a month. Second verse as good if not better than the first! From noon clockwise. Lechon burger, onion rings, Tokyo Dog, fries, burger with kimchee. What I noted is while the Boba Burgers tend to be busy the flavors are distinctive, work well with one another and don't overpower. I commented the lechon burger, with delightfully crispy lechon, was more than the sum of its many parts.